How much will my home loan repayments be? If there is the question you have asked yourself, you can use this FREE home loan repayment calculator to work out what the minimum weekly, fortnightly or monthly loan repayments would be for any loan amount. I built this free home loan repayment calculator for my personal use in order to compare the mortgage repayments across different home loan mortgages. I believe home loan comparisons are necessary before I take any mortgage loan. This useful mortgage repayments calculator estimates you monthly, fortnightly, or weekly home loan repayments of a Principal and Interest home loan or an Interest only home loan. I find the fortnightly mortgage payment or bi weekly mortgage payment is really useful because I am paid biweekly. 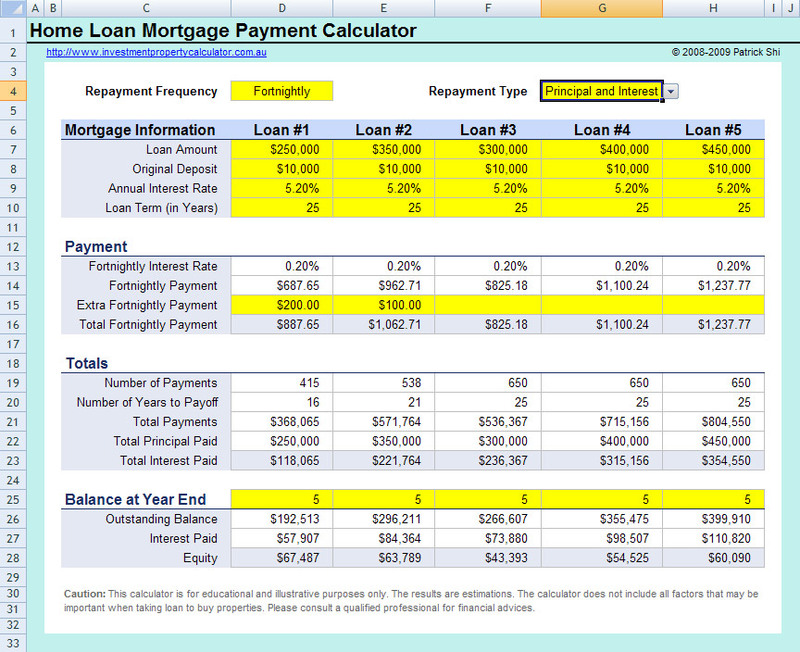 The mortgage home loan repayment calculator allows you to compare up to 5 (five) home loans. You can name each home loan. In addition, you can see how extra repayments can affect your home loan mortgage repayment in terms of time and amount. 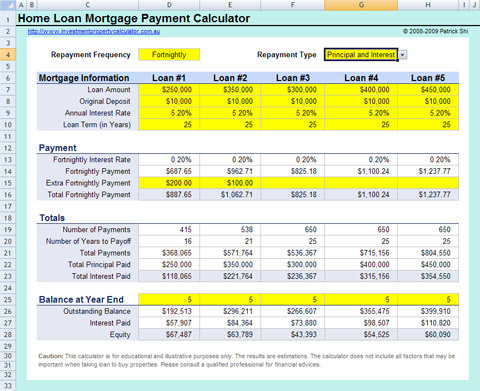 Here is a screen shot that will give you a better idea that what you need to do and what this free home loan repayment calculator can tell you. Download FREE Mortgage Home Loan Repayments Calculator Now! If you like simple things, you may want to download the Free Simple Home Loan Repayments Calculator. It allows you to compare up to 5 home loans however without considering any honeymoon loans. You might want to have the detailed mortgage amortization calculation on top of the simple result from the home load repayment calculator. You can download the Free Home Loan Mortgage Amortization Calculator. You can do amortisation based on weekly payment, fortnightly payment, semi-monthly payment, monthly payment, bi-monthly payment, quarterly payment, semi-annually payment, or annually payment by varying your loan terms from 1 to 30 years. BTW, you might spell "mortgage calculator" wrongly as "morgage calculator" when you search repayment calculator on search engines, but I am sure you don't want to get it wrong when you decide to take a home loan. I hope the free home loan repayment calculator or the Free Home Loan Mortgage Amortization Calculator will be able to help you to make a decision. You might also find that the Free Investment Property Calculator is quite useful.